I think it is apropos to post about bravery on Veteran’s Day. I didn’t choose the topic because of the day, but it fits perfectly. I chose to talk about bravery today because I want to talk about a specific aspect and tomorrow will be too late. One comment I have heard from several folks is how brave I’m being. I’m not. And I’d like to explain why I don’t feel as if I am being brave. Bravery for me has certain criteria associated with it. To be brave, one must be fearful of what they are about to attempt, and the fears must be specific, but the brave do what has to be done anyway. Despite their fears. And for me bravery involves moving forward with eyes wide open, knowing what lies ahead—the horrors that await—and yet still move forward. In this latest life adventure, I don’t know what is up ahead. I know the road is going to be rough, but the specifics of the experience are yet unknown. And no one can tell me specifically because every person is different. Yes, I can gather some general information and I have been doing so with the limited time I’ve had to prepare. But that doesn’t make me brave. Some might argue that it is brave to face the unknown with courage. Maybe, but I’d argue that we face the unknown every day of our lives … facing it is commonplace, and for me bravery takes something higher. A small bit of fear exists at the moment, when I stop doing and think for a moment or two too long. Fear about how my body will react to the chemical cocktail its being given. But overall, I don’t think about it. I push those thoughts to the side because they don’t benefit me. Thinking about them will not change the outcome one iota, and I have too many things to get done to let the tiny bit of fear leap out and overwhelm—because that’s what it’ll do if you let it. Why doesn’t that fear count as bravery, since I will go through the process anyway? Because it isn’t specific. This morning when thinking about this my mind went to the Three Billy Goats Gruff and the bridge they had to cross. The first time you cross the bridge, you don’t know about the dangerous troll under the bridge. You simply step onto the bridge and into the unknown. It doesn’t require bravery. When the troll leaps out and tries to eat you, the only thing you’re thinking about is how do I make it over the bridge alive?? And you somehow do. Aahhhh, but the next time you reach the bridge and need to cross it, you will have to be brave. Why? You know about the troll—it is no longer an unknown factor. You know the danger exists and specifically that someone wants to make you dinner. You have a real, specific fear, and yet you cross the bridge anyway—bravery. 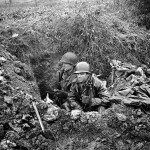 I used the pictures of the soldiers in the foxholes because they exemplify bravery to me. The men and women at the front of battle, going into battle, not just with the fear that something bad might happen, but specific fears from having been battle-tested, and yet serving their country and all of us because it is their duty. My Grandpa was a tail gunner in WWII, and one of the bravest people I have known. Not because he was without fear. He was probably afraid to climb into that plane the first time, but he didn’t know what would happen when flying a real mission vs. a training mission. But he showed his bravery every time he climbed BACK into the plane—knowing bullets would be flying at him, knowing he was likely to lose one or more of his crew. He did it for the pride of serving his nation. So today, while facing chemotherapy, I am not brave. I will show my bravery the day after tomorrow, when I must go back. When you’re dealing with crises, it’s hard to look beyond them. I understand. I’m at the beginning of mine… and hopefully will be able to continue cheering on Nano because that will be an indicator to me that I’m still in control (do NOT shatter my illusions), but if I miss a day here or there, I will have to accept that and keep moving forward.